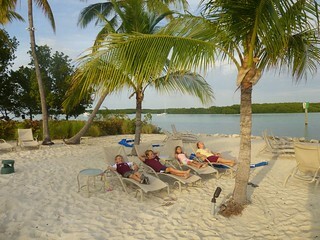 Many people agree that the beach at Fort Zachary Taylor State Park is one of the best in Key West. With a beach and a cool historical fort to see this seemed like a perfect outting for the day. So the kids grabbed their Florida State Parks junior ranger folders and off we went. 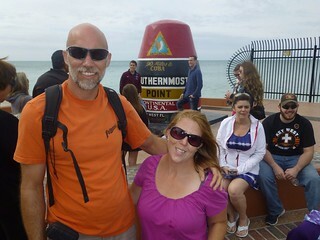 But before that it was a quick stop to the southernmost point. I’m gonna tell you all about the Keys. Gas is kind of expensive as well as a lot of other stuff. Next you can’t find a T-shirt on Key West that doesn’t say Key West. Also the water is very cool. I wish we’d gone snorkeling but we didn’t have gear. We went there when there were some clouds and wind but it was still fun. We stayed at an expensive place but we got to go to a yacht club for free. It had a beach paradise and a pool that was just perfect. The showers were okay. When I was taking my shower back home I didn’t know that it was plumbed backwards and it turned out my pressure was the worst too, it was just a strong mist. So I ended up getting misted with cold water in a tiny dark compartment that somehow got classified as a “shower.” Yeah. That deserves quotations. Meanwhile Dacen had an awesome shower that was the opposite of mine and Papa had a pretty good one too. Mine should be called a rewohs and a lower class one at that. First thing Monday morning we got up and around and headed off to the Truman medical center to have Brielle looked at. After we dropped off the girls at the medical center the boys and I went to Home Depot to try to figure out a solution to our suboptimal sewer situation. We found a part that we thought would work and went back to get the girls. They were not out yet so we took a quick stroll on the main drag of Key West…cigar shops, bars, art galleries, and tourist stuff. We got back just as Brielle and Steph got out of the doctors office with a prescription in hand. 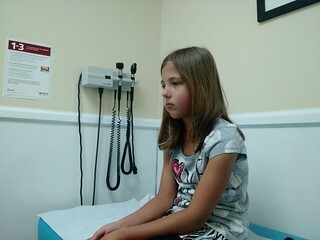 On our drive down to Key West we could tell Brielle wasn’t feeling too great and this morning she was worse. She had a fever and it was Sunday so doctor options were limited. We doped her up with Tylenol to try to get through the day. Despite the fever she was very excited because our friends Bill and Karen Miller (who we visited in Mobile) were in Key West on holiday along with some other church friends, Hollis and Rae. 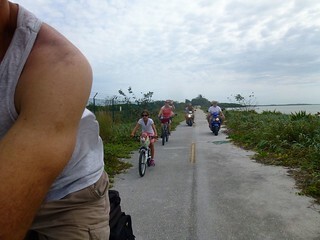 They were all going out to Geiger Key to stroll on Boca Chica beach and so we decided to tag along. We followed them as they rode their scooters and when the road ran out we hopped on our bikes and rode until even the trail petered out. With a week of on site work with a client in Ft Lauderdale completed we were off to that set of dots off the southern tip of Florida…like an ellipsis placed by the great Author as His own thoughts drifted toward relaxation at the end of His creation sentence. Florida Keys, here we come! !